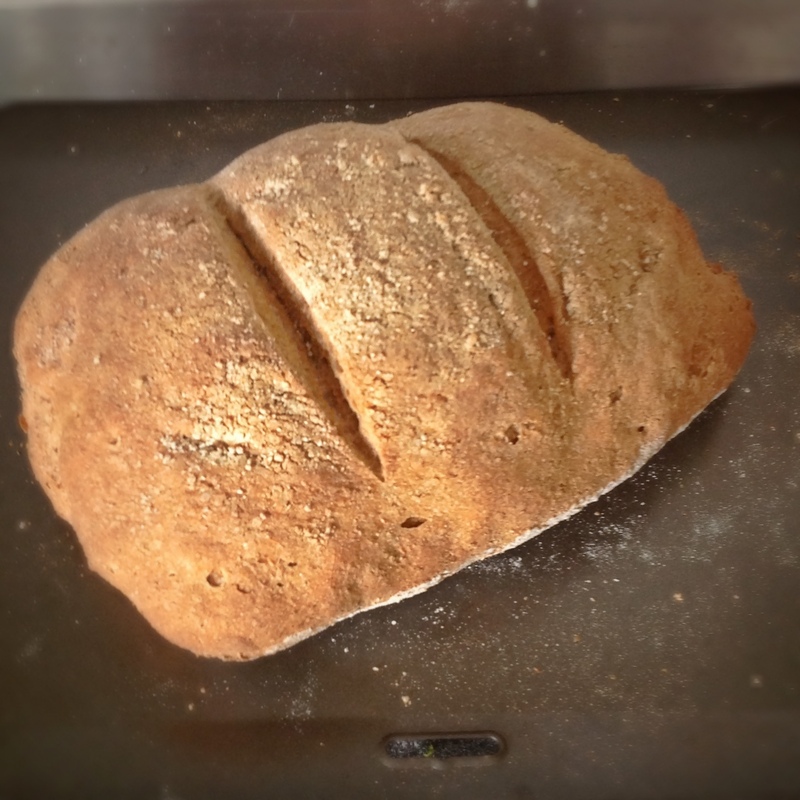 Tears of joy and oh so proud – it is ridiculous quite how happy a good loaf of bread can make me! I still find it somewhat unbelievable that three very simple ingredients: flour, water and salt can, with a little bit of care and work create something so marvellous as this loaf – here cut in half, look at that air! This is my first loaf made solely with white sourdough starter and white bread flour. It took most of yesterday but I had a lot of study so didn’t mind spending the day at home. I used Dan Lepard’s method from The Handmade Loaf and changed the quantities of ingredients in order to get one decent sized loaf instead of 2 smallish ones. Can honestly say, having sampled a whole load of sourdough bread over the years from places like St. John, Elliott’s, Balthazar (the London outpost, which I did not like other than the bread), local bakeries and all sorts of good restaurants – this loaf is up there. So proud. Even though I didn’t slash it enough (slashed around circumference but my knife was not sharp enough). It rose in the oven beautifully and unlike River Cottage method, Dan recommends a lower oven temperature (200C fan instead of 250C or as high as it will go – River Cottage) and spraying the top of the loaf with water before it goes in. Next time I’ll just slash across the top. I’ll also have to figure out the timing a bit better so that it can have a longer and slower second prove overnight and I can have it ready for breakfast. Shouldn’t be too much of a problem in cold weather. I’m still going to keep my rye ‘mother’ too, it’s been fascinating watching the white and the rye behave completely differently. The rye is just happy slowly bubbling, bubbles throughout the jar and quite a sour smell. The white, on the other hand, tends to have bubbles on the surface and I must be super careful when opening the jar to refresh – it’s almost exploded a couple of times. It also rises more over a 24 hour period. Totally fascinating. Seems ages since I’ve made sourdough bread, it’s been over a month I think. I’ve kept the mother going, it spends 3-4 days in the fridge, then the next 3-4 days I feed it. I thought I’d ruined it this week as it went well over 24 hours without being fed and I’d run out of rye flour to feed it with so had to improvise with a mix of wholemeal and spelt. That felt a bit weird as the texture is completely different but sourdough mother is a thing of wander and seems to be able to cope with whatever I throw – or forget to do to it. So, now it’s back in the fridge, fed with rye and looking fine. The loaf is good too, although I haven’t tried it yet, only halved it to freeze. This bread freezes very well. The texture inside felt light and airy and there’s a good crumb to it too. My new method of making a slightly wetter dough and using a mixer for kneading really seems to be working. On this occasion, I used 200g strong white, 100g of strong wholemeal flour, 380ml water and probably around a ladle and a half of starter to make the sponge on Friday night before going to bed. Now that I’ve made sourdough quite a few times, I tend to just pour starter in from the jar without measuring and I’m not even that precise with water – you just get to a point when it feels right. For beginners though, I’d suggest adding a ladleful at first and also no more than 350ml water per 500g total flour. Yesterday morning I added another 100g of each strong white and strong wholemeal flours and a teaspoon of salt. Kneaded in the mixer for 6 minutes, shaped, left for an hour then deflated, shaped and left for another hour. You do the deflating and shaping four times in total. Then deflate one more time, roll up tightly, then flatten the dough, blanket fold and shape into a round or a loaf shape, coat well in rye flour and leave to prove on a flour dusted board, covered with plastic bags for two and a half to four hours. Yesterday’s dough proved for about three and a half. To bake, the oven needs to be very hot, with a baking sheet in and an empty sandwich tin if you want to steam the oven as well. I had the oven at 245 degrees C for the first ten minutes then at 180 for the next 35 minutes. Slash the dough once you’ve transferred it onto the baking sheet and I also sprayed it with more water to help the crumb. Right, now back to early modern European colonial expansion, oh joy! I got a bit distracted while sourdough was in the oven so it may have been baking a touch too long. Didn’t steam the oven either, just thought I’d see how that influences the final loaf. We shall wait and see, have not tried it yet, the crumb looks good though. Have been busy making jerk pork belly and putting up a bunch of new photos in the big frame we got earlier today. Took quite a long time and now my pork belly timing is probably a bit off too… Oh well, am sure it’ll be fine.